For two or three people something quick, simple and delicious if you have cultivated a good butcher to supply you with venison sausages. Or you can use Cumberland, Lincoln or any of your choice. Served here with butterbeans or if you prefer with creamy mashed potatoes. Heat the oil in a flameproof casserole and brown the sausages on a medium heat, without splitting them. Transfer to a plate. Brown the bacon or pancetta together with the garlic and shallots in the pan. Slightly crush the juniper berries to release their flavour, return the sausages to the pan, add the wine, berries, thyme and bay leaves, seasoning lightly as you go. Bring to a simmer, cover with a lid and reduce heat to as low as possible, leave for 30 minutes. Add the mushrooms, stir well, cook for a further 20 minutes without the lid. Make the butterbean crush towards the end of the cooking. Remove sausages and vegetables to a warm serving dish. Now mix the flour, mustard powder and softened butter to a smooth paste, then whisk into the casserole a little at a time. Let it bubble gently for a bit, whisk in the redcurrant jelly, return sausages and vegetables to the casserole, and serve with creamy butterbean mash. 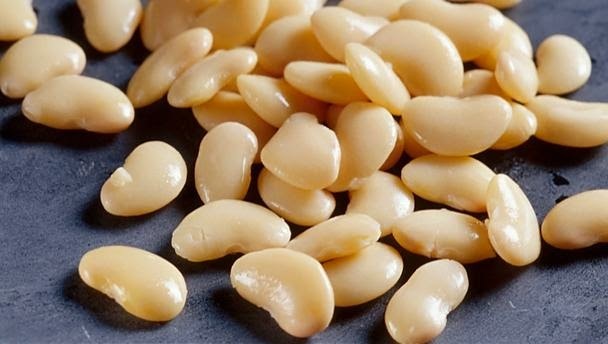 To make the butterbean crush: Drain and rinse the butterbeans then sauté gently in the olive oil and garlic in a saucepan, seasoned with salt and pepper. Keep stirring. When they start to get sticky – about 7 minutes – crush with a potato masher, add the cream and parsley, continue crushing to the desired consistency. Mash them if you like. Keep warm.